The artist was once a messenger of the gods. Breathing in, the Greek actor was lifted into a realm of thought and inspiration. And breathing out, the will was strengthened. Can modern actors again become messengers through their own power of description and dramatization? Anyone with an interest in the spoken world, acting, or the future of the theatre will welcome this book in which the author goes beyond simple character study and interpretation, as he re-examines the forgotten, esoteric, qualities of acting. 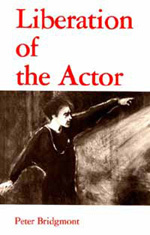 Based on Rudolf Steiner's ideas on speech and drama, he provides a new basis for a true liberation of the contemporary actor. PETER BRIDGMONT is involved in voice training at the Globe Theatre in London. He has been a professional actor in theatre, films, and on radio and TV. In 1975 he and his wife, Barbara, opened the Chrysalis Theatre Acting School in London.